The Canary Islands are volcanic islands and, unlike the islands that come from continental fragments, they have a life cycle similar to living beings’: they are born, grow, erode and eventually disappear. 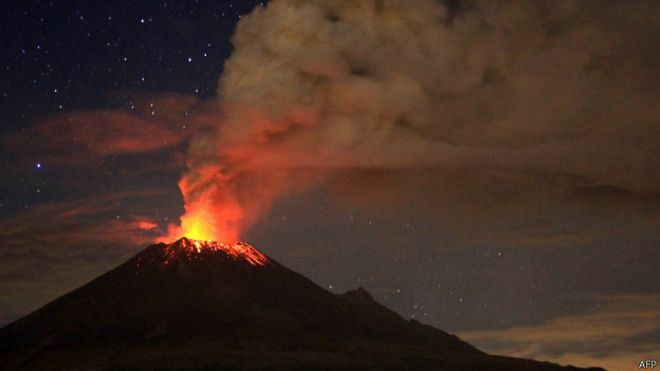 Birth: it refers to the underwater formation of the island, caused by a hot spot in the oceanic crust. Growth: it refers to the sub-aerial construction and drained stage. Erosion or dismantling, due to the erosive agents of air environments. Basal plain stage, with low height habitats. In the Canary Islands, as in the rest of the archipelagos that make up La Macaronesia, there is evidence of these cycles of the islands. For example, when exploring the seabed, flat top submarine ridges have been discovered around the emerged islands, which can be called “Paleomacaronesia”, which are remnants of islands that once emerged to the surface. 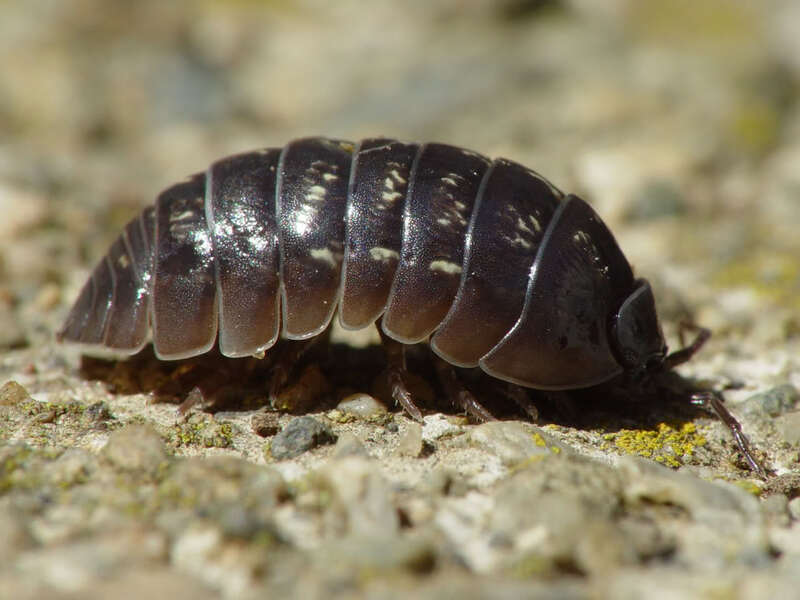 Thus, between the Peninsula and the Canaries we find Lars, Anika, Nico, Last Minute, Dacia, Concepción, Amanay … that were created in the Paleogene (64-25 million years ago) by the same hot spots that 25 million years ago, in the Miocene, made emerge the isles that we know today. These seamounts of Paleomacaronesia are about 120-130 meters deep, which coincides with the maximum sea level fall in the ice age. In those periods when the sea level drops, these islands would almost emerge, forming a chain of islands, which would link the current Macaronesia with the African and European continents. On the other hand, in some areas such as Southwest of the island of El Hierro, peaked summit seamounts have been found, which is the characteristic that proves that they have never emerged nor been subjected to erosion. This applies, for example, to the seamount called “Las Hijas”, where the accumulation of material has not been yet enough for them to emerge. Should they ever emerge,the number of islands in the Canary archipelago would increase. The following diagram may be the age of the islands and the cycle phase they are. “Las Hijas” would represent therefore the birth phase of the volcanic Canary Islands. El Hierro, Tenerife and La Palma would represent the drained and sub-air construction phase, and they still keep volcanic activity and they can keep amassing materials and height. La Gomera and Gran Canaria are the example of the cycle of dismantling, because in the past they were much higher than today, so erosive agents are playing their role, and the destructive processes predominate over the constructive ones. The Mahan volcano, comprising Fuerteventura, Lanzarote and surrounding islets, would be the representative of the basal plain stage with their own habitats of low-lying areas. In the Canary Islands we have no representation of the terminal phase of disappearance. This phase is well represented in The Savage Islands, with structures that emerge barely 30m above sea level, which predicts their future disappearance. 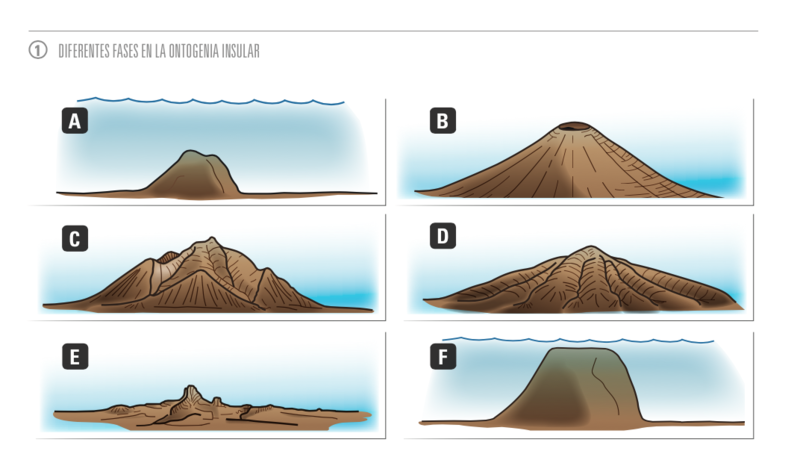 Amanay, Concepción and Dacia, in the Canary Islands, would be the example of phase flat-topped seamount that would emerge only when sea level came down considerably. We continue in this new post on our blog telling, tourists and residents, some curiosities on the island of Fuerteventura. 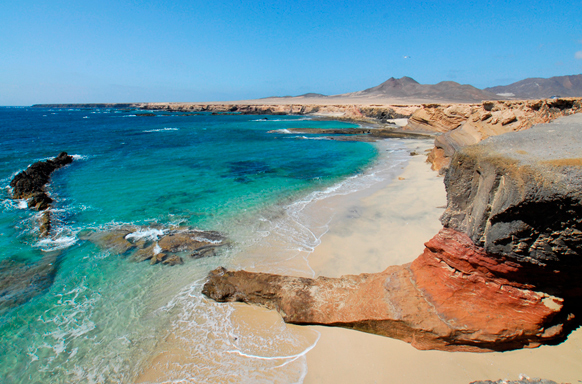 Fuerteventura is the eldest of the Canary Islands. It originated, like the rest of the Canaries, through marine volcanic processes, which began to surface about 22 million years ago, and it is uncommon to find volcanic islands over 6 million years old, so it is a true challenge of nature. 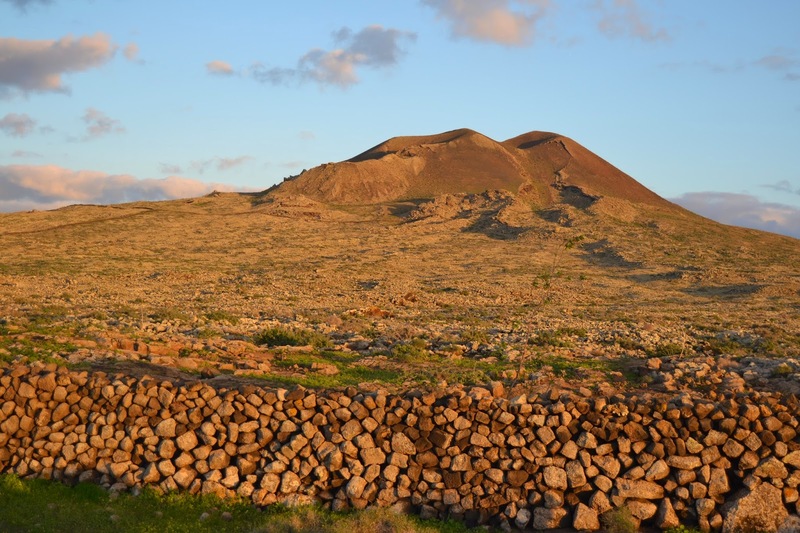 The last volcanic eruption on the island was about 10.000 years ago, and it was the one that formed the Volcano of La Arena, in the municipality of La Oliva, with a magnificent landscape, known as “Malpaís de La Arena”. Fuerteventura was originally made up of two separate islands, separated by a sandy isthmus that, after several volcanic episodes, grew and lformed a single island. However, throughout history these two parts continued somewhat divided. 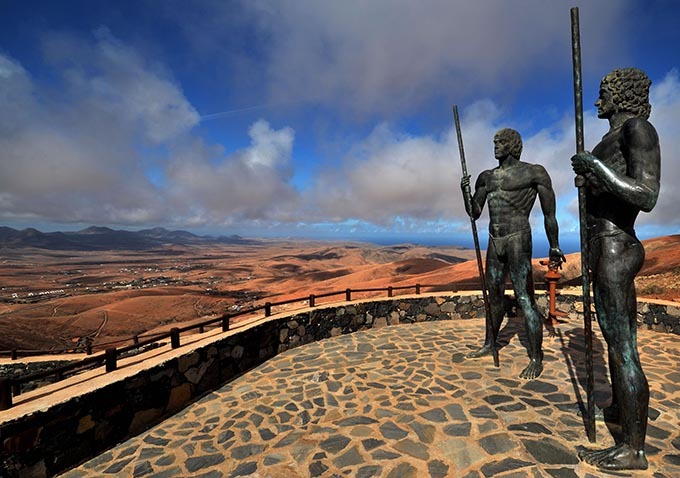 When conquerors arrived in Fuerteventura, called Erbania then, the island was divided into two kingdoms: Maxorata (north) and Jandía (south), each ruled by a warrior: Guize in the north and Ayoze in the south. When the conquerors arrived, these great warriors finally laid down their arms and surrendered, along with their men, the island becoming part of the Crown of Castile in 1476. The first capital of the island, Betancuria, is then set (up to XIX century), after the Norman conqueror Jean de Bethencourt. At the time of the conquest (XV C.), the word “Maho” was used to refer to the Amazigh people who were on the island of Fuerteventura and Lanzarote when the conquerors arrived. There are two hypotheses of the etymology of the term: first it was thought to come from the Amazigh word “Mahu” which means “to skin, that is, to remove the skin” in relation to a type of footwear made of the skin that was used at the time. Another hypothesis, perhaps best known, assures that it comes from the word Maxorata, the Amazigh “Mahâr-at”, which means sons of the country, and that was the name that was given to what is now the northern part of Fuerteventura, to the isthmus of “La Pared”. Later on, “majorero” began to be used exclusively to refer to the people born in Fuerteventura. Its nearly 80kms of beaches turn this island into the best prepared for bathing and for water sports of all the Canary Islands. Many people from the rest of the islands come to Fuerteventura in summer to spend their holidays, due to the charm of its beaches. All the territory of Fuerteventura has been declared Biosphere Reserve since May 2009 due to its wild nature. Despite its arid nature, this island has a rich biodiversity and is the largest representation of steppe and desert habitats in the whole archipelago, and also in the European Union, being a perfect Geo-paleontological observatory (50 sites with fossil records). Its marine environment is undoubtedly the richest in the Canary Islands. 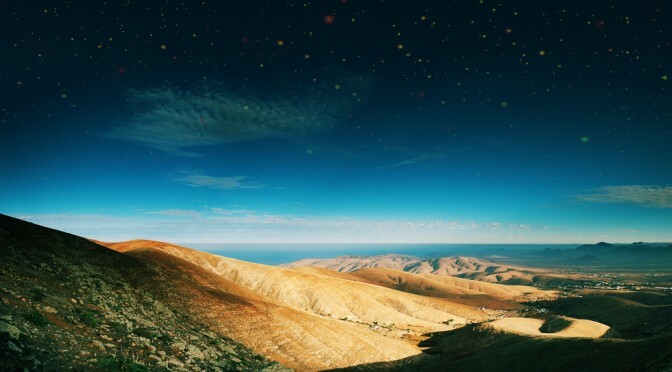 On July 31st2015, the sky of Fuerteventura was definitely acredited with a certificate for the quality of its skies, becoming the third Starlight Reserve in the Canary Islands, with Tenerife and La Palma, out of the 7 existing throughout the world: Sierra Morena and Sierra Sur de Jaén (Andalusia), Montsec (Catalonia), National Park Fray Jorge (Chile)and Acadian Skies and Mi’kmaq Lands (Canada). 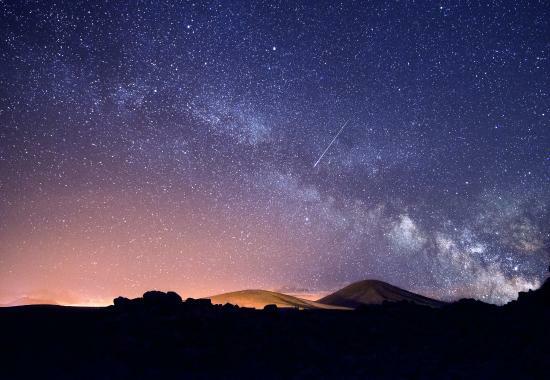 With this certificate, Fuerteventura is committed to protecting the quality of their night sky, also associated with cultural, scientific, astronomical, or natural values. The coast of Fuerteventura, especially the Jandía peninsula in the south, is one of the favorite places in the world for sea turtles to nest and breed. Out of the 8 species of turtles in the world, 4 of them frequent the “majorera” coasts. Cofete beach in the municipality of Pájara, has been chosen as setting for Hollywood blockbusters, including “The Planet of the Apes” (1968) and, more recently, the movie “Exodus” (2014), all because of its spectacular landscape. The island of Fuerteventura has 4 lighthouses: one in Cotillo, another one on the island of Lobos, one in “Punta de Jandia” and one of special beauty, the one on “La Entallada”, built on a cliff. If you have visited the island of Fuerteventura, if you are going to visit it soon, or if you are one of its residents, but do not know the history of this Atlantic island thoroughly, here we leave some curiosities that you”ll surely like to know about both Fuerteventura and the Canary Islands as a whole. La Macaronesia is the set of five of the North Atlantic archipelagos: Azores, Canary Islands, Cape Verde, Madeira and the Savage Islands. It comes from the Greek word makárôn nêsoi, which means “happy or fortunate islands”, where it was assumed that deceased heroes of mythology would abide. 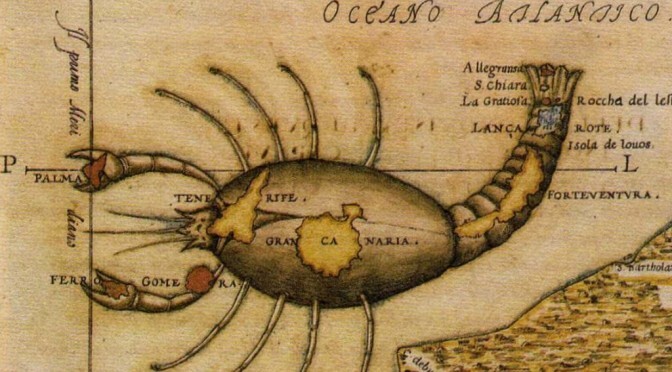 Macaronesian islands were never connected to the continent, as they are volcanic islands that emerged from marine eruptions, and according to mythology, it was thought that these islands were the summits of Atlantis (submerged continent), emerging to the surface. 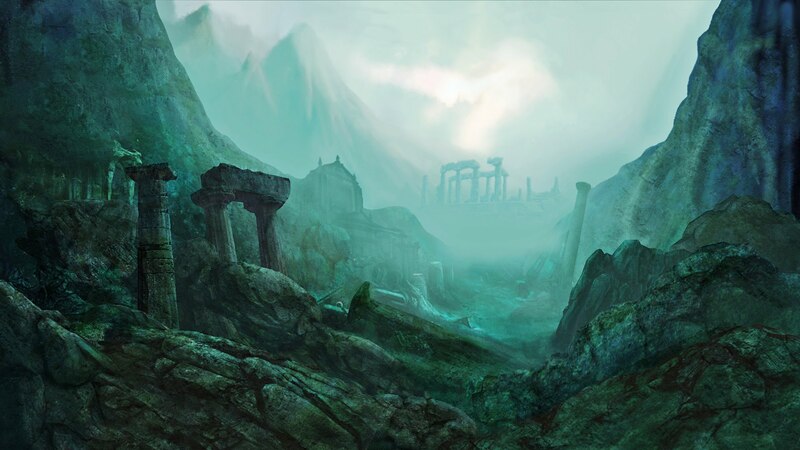 Atlantis, according to mythology, was the continent that Zeus sank in punishment for its inhabitants” bad behaviour. These islands received its name because after the first expedition sent by the king of Mauritania to meet the ends of the ocean, beyond the Pillars of Hercules (Gibraltar), what they found when they reached these islands was a fierce breed of dogs (the Latin: can, canis), so the name the islands received was “Insula Canaria” (Isle of Dogs). 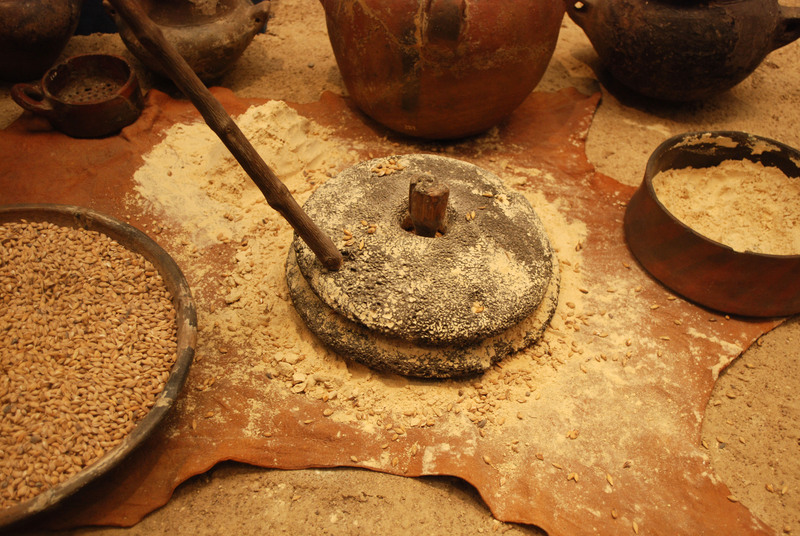 Energy food derived from some roasted and ground cereals such as wheat, rye, corn, barley … Its highly nutritious properties turned it into the staple food of this people for many years. This powder is often added to milk at breakfast, also to “el potaje canario”or kneaded , resulting into “la pellla de gofio”. “Majorero” goat cheese enjoys appellation of origin from the February 16th , 1996, and it can be made only with goat milk from the island or a mixture of up to 15% of Canarian sheep milk, before letting it age. In the case of mature cheese it features the palm leaf on its bark, which is used in “empleitas” to make the mould that shapes it. The most famous ones are cured with gofio, paprika or oil, although other varieties are found. In the early twentieth century, salt was one of the resources that allowed the islands to generate more revenue. The climate of the Canary Islands is ideal for the production of sea salt, which was exported all over the world, and which also was of great importance to preserve fish, when the phenomenon of freezing had not yet been discovered. The cochineal is a parasite insect of the cactus, from which a very bright red dye is obtained out of its blood , used in ancient times to dye fabrics. Until the mid-nineteenth century it was a precious commodity, as the high society’s garments were dyed with it. Eventually, much cheaper but less safe synthetic dyes were discovered. This dye is used today as a food colouring (E-120) and in the pharmaceutical industry, and small productions are preserved on the island of Lanzarote and La Palma. 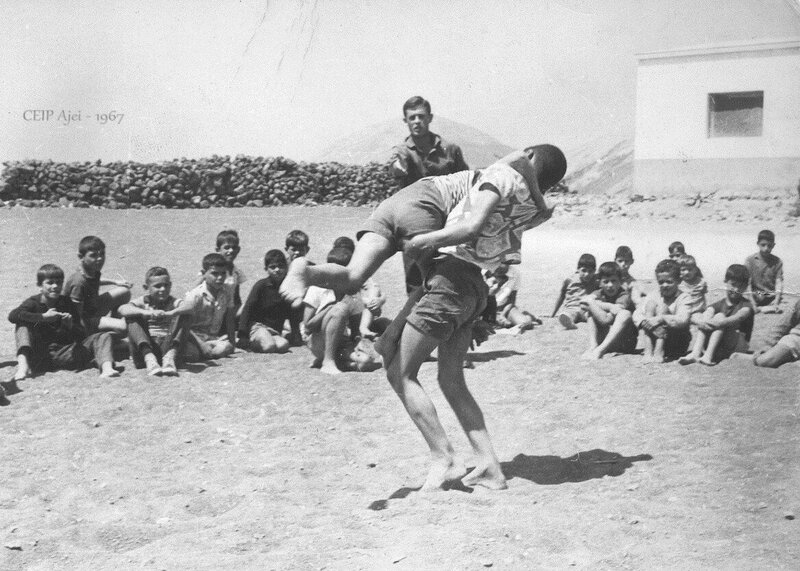 This sport has a long history among the Canarian population, as it has been practised in the island since these were inhabited by “los Guanches” (ancient inhabitants). It consists of unbalancing the opponent and making them touch the ground with any part of his body other than their sole. It is played on sand enclosures called “Terreros”. Plucked string instrument, typical of the Canary Islands, of small dimensions (38-40cms) and due to its curved back, hump-like, it’s recognized as the ” resounding little Camel”.